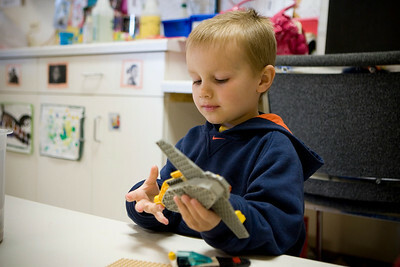 Mike Greene - mgreene@shawmedia.com Brandon Clark, 5, plays with a Lego toy during play time at House of Children Tuesday, April 10, 2012 in Woodstock. 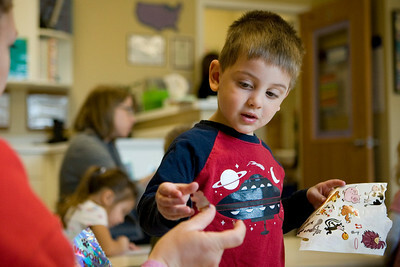 Mike Greene - mgreene@shawmedia.com Devin Haggerty, 3, takes a sticker while decorating at House of Children Tuesday, April 10, 2012 in Woodstock. Mike Greene - mgreene@shawmedia.com Julian Segura (cq), 4, picks out Lego pieces to play with as Braden Clark, 5, and Shelly Rebman (cq) watch on Tuesday, April 10, 2012 at House of Children in Woodstock. 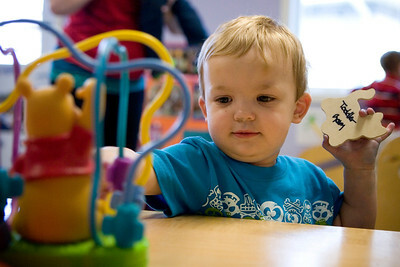 Mike Greene - mgreene@shawmedia.com Jonah Kelley, 1, plays with toys at House of Children Tuesday, April 10, 2012 in Woodstock. 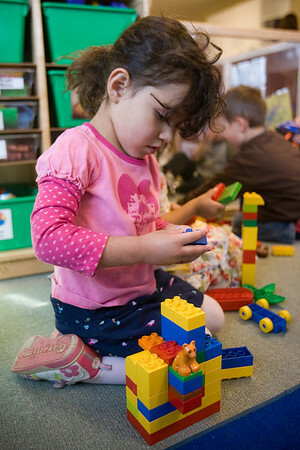 Mike Greene - mgreene@shawmedia.com Bella Schlopp (cq), 3, plays with building blocks Tuesday, April 10, 2012 at House of Children in Woodstock. Mike Greene - mgreene@shawmedia.com George Jones, 4, crawls under stairs while playing a game at House of Children Tuesday, April 10, 2012 in Woodstock. 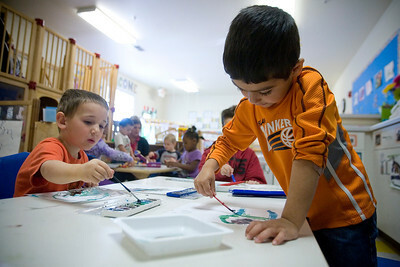 Mike Greene - mgreene@shawmedia.com Julian Segura (cq) (right), 4, works on a watercolor painting at House of Children Tuesday, April 10, 2012 in Woodstock. 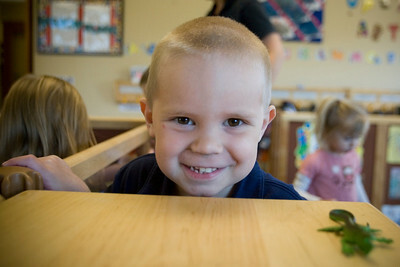 Enrollment costs for more than half of the children at House of Children are subsidized by state funds. 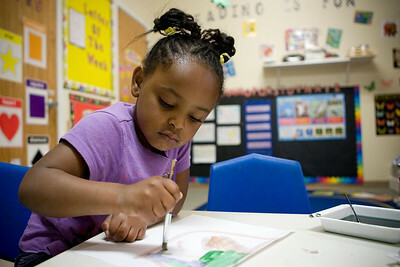 Mike Greene - mgreene@shawmedia.com Rhianna Witherspoon (cq), 4, works on a watercolor painting Tuesday, April 10, 2012 at House of Children in Woodstock. Mike Greene - mgreene@shawmedia.com Chloe Soto-Garcia, 4, peeks out from underneath a staircase while playing at House of Children Tuesday, April 10, 2012 in Woodstock. Enrollment costs for more than half of the children at House of Children are subsidized by state funds. Mike Greene - mgreene@shawmedia.com Liam Kelley, 3, spies the camera at House of Children Tuesday, April 10, 2012 in Woodstock. 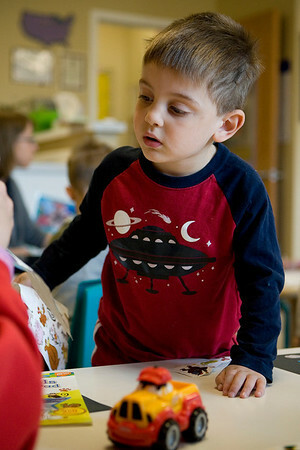 Mike Greene - mgreene@shawmedia.com Devin Haggerty, 3, leans in for a closer look at stickers to choose from while decorating at House of Children Tuesday, April 10, 2012 in Woodstock. Mike Greene - mgreene@shawmedia.com Rhiannon Louise (cq), of Woodstock, reads a book to students at House of Children Tuesday, April 10, 2012 in Woodstock. Early childhood educators are concerned about cuts to state subsidies that fund their programs. 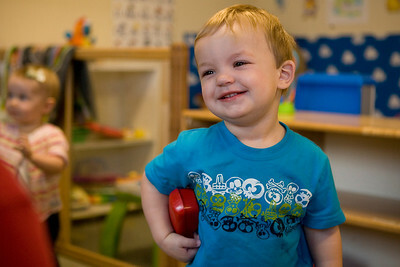 Mike Greene - mgreene@shawmedia.com Jonah Kelley, 1, smiles while playing with a phone Tuesday, April 10, 2012 at House of Children in Woodstock. 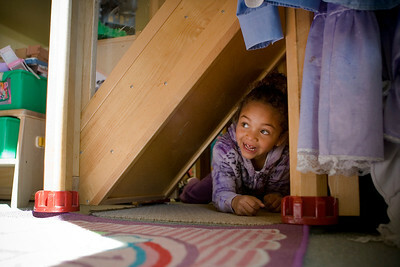 Chloe Soto-Garcia, 4, peeks out from underneath a staircase while playing at House of Children Tuesday, April 10, 2012 in Woodstock. Enrollment costs for more than half of the children at House of Children are subsidized by state funds.